You can taste the Espresso from La Teresita with your whole soul. I’ve been to a lot of places they seem to think they have good coffee, only to find that they do not have good coffee—this seems common in the Mid-West and much of The Deep South, where the coffee is just a kind of utilitarian: a rusty tasting hot brown water for helping you wake up in the morning and nothing else. And while gourmet coffee culture has spread throughout most of the country due to the influence of Starbucks, there are still some vast coffee deserts out there where the best you can hope for is a cup of yellow-beige truck-stop joe (the stretch of interstate between Atlanta and Nashville, for example). Tampa, thankfully, has deep roots as a coffee town, and as a place that take coffee very, very seriously. Tampa can be a hard town to love, sometimes. It has a notorious learning curve, and a lot people move in, and ultimately move out, without ever really understanding it or knowing much about its history. First, there is no Tampa without Ybor City. Before Ybor, Tampa’s Latin Quarter and center of the Cigar industry, Tampa was a sleepy little outpost, home to fewer than 1000 people. In the 1880’s, when Don Vincente Ybor founded a company town around his cigar factory, thousands of immigrants (Mostly Spanish, Italian, Cuban and German, but also Greek, Romanian-Jewish, and Afro-Caribbean) moved in, turing it into a full-sized city in less than a decade. Tampa became a bustling rough and tumble town famous for cutthroat politics, organized crime, and radical labor movements (I plan to write about all of these at length soon, so stay tuned). Toward the end of the 20th Century, however, the city tried to re-brand itself as an ultra-modern Yuppie paradise, hollowing out the city center, and (sometimes literally) paving over its own identity. Fortunately, that didn’t quite work, and it seems like recent years have seen a renewed interest in reclaiming Tampa’s complicated history. This brings me back to the coffee. Coffee has always been central to life in Tampa's immigrant communities. When trendy foodies in other towns were ‘discovering’ Lattes in the 1990’s, Tampa’s Cuban lunch counters had already been serving Café Con Leche every morning for over a hundred years. 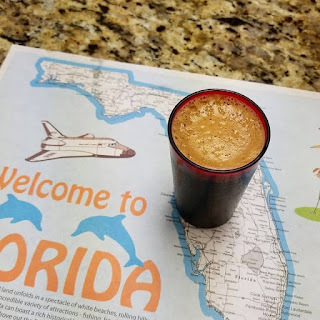 And while Seattle’s gourmet coffee culture was in its infancy in the 60’s and 70’s- Tampa’s Columbia Restaurant has been employing a dedicated master espresso maker since 1905. What I’m getting at here is that the roots are deep. Not only that, but it recent years, those deep roots have collided head-on with the larger gourmet coffee wave, resulting in --excuse me-- some damn fine cups of coffee. The Café Ybor from The Bunker in Ybor City: This is a Café Con Leche sweetened with condensed milk. It’s sweet, creamy, and just a little bitter, almost like drinking hot liquid coffee-flavored ice-cream, and yes, that’s a very good thing. Café Con Leche from Spaddy’s in Seminole Heights: Spaddy’s Coffee is my home-base morning coffee shop, and their Café Con Leche, while it has a bit more foam than a traditional con leche, is beautiful and buttery-tasting, and especially good with a pastry from Mauricio Faedo’s, the bakery next door. The Cortadito from Blind Tiger in Ybor City: This is an equally sweet and bitter espresso concoction, and is probably the best example of what I meant by the collision of the old and the new when it comes to coffee in Tampa, it's a gourmet take on a traditional cup, and it's a good time. The Espresso from La Teresita In West Tampa: To me, this is the Ur example of a cup of Tampa coffee: sharp, sweet, hard-hitting, mysterious. Incredibly simple, but with serious intensity and depth. I have no idea how they do it. It’s a simple thing done near perfection, this coffee will change you.